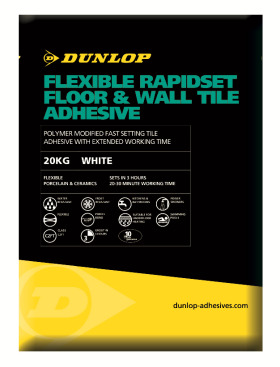 Get your tiling finished in double-quick time with Dunlop’s new Flexible Rapidset Floor & Wall Tile Adhesive. An extended open time of 60 minutes and a longer working time of 20 to 30 minutes allow for larger mixed and give additional time to apply the adhesive and fix the tiles. What’s more it’s fast-setting and suitable for grouting in only three hours meaning no waiting around to finish the job! Highly flexible and setting in white, Flexible Rapidset Floor & Wall Tile Adhesive can be used to fix porcelain, ceramics, natural stone and mosaics on most backgrounds and applications.